Thanks again for providing the Savvy Hip Hops delivery service, it’s been great. 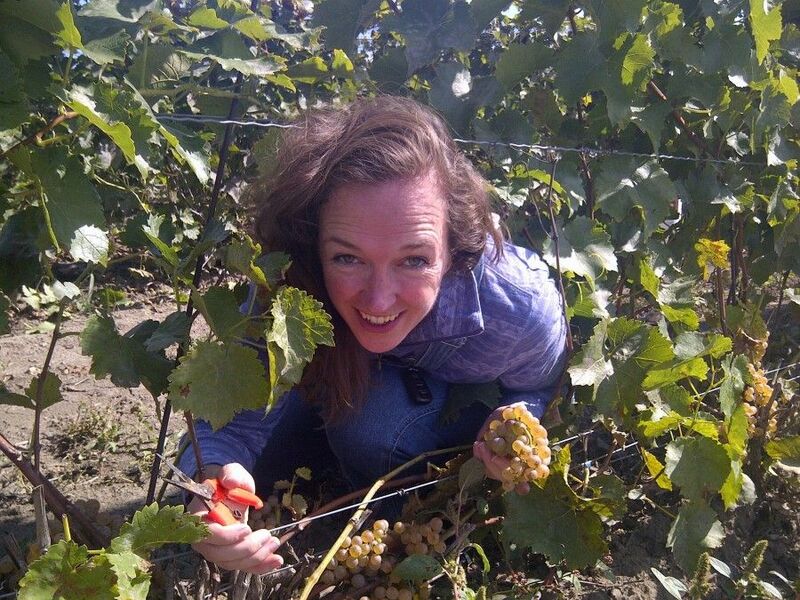 Join our Savvy Sommeliers for a day discovering Prince Edward County on Saturday May 8. The Savvy Bus is back by popular demand & we’re making it easy for you to enjoy a day out in The County with a Sommelier as your tour guide. Sit back & relax in our luxury coach as we explore the backroads of Prince Edward County. 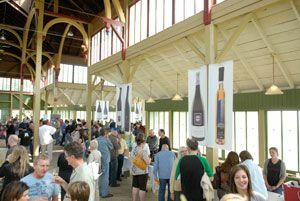 We will stop in Picton to take in Terroir Wine & Farmers Market to discover all of the great wines & foods under one roof at the historic Crystal Palace. Many County wineries will introduce their new spring releases & pair their wines with locally made gourmet foods right before your eyes! Your Savvy Bus Tour will continue as we visit The County’s only craft brewery – Barley Days Brewery for a taste of something different. Then to top it all off, dinner will be served in the vineyard at Casa-Dea Estates. 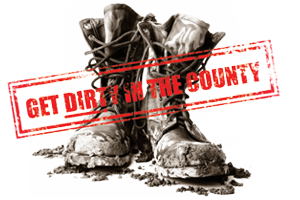 It will be a fun day meeting the dynamic people who are involved in the growing reputation of ‘The County’. The Savvy Bus will depart downtown Ottawa at 8am from the Ottawa Marriot (100 Kent St). We will pick up passengers at Starbucks in Pinecrest Mall & Starbucks on Princess Street (near the 401) in Kingston. We are aiming to arrive at Terroir Wine & Farmers Market by 11:30am. If you have a small back yard garden or deck or balcony… you can grow heirloom tomatoes. Vicki Emlaw will answer any questions you have and a selection of good old fashioned tasting tomato plants will be available for sale. What Kind of Cool Are You? Join The Cellar Sisters in an exploration of cool-climate Chardonnay and determine your “kind of cool” – crisp, fruity, rich or smooth. Blind taste four different PEC Chardonnays and select the one style which appeals to you most. Learn about each wine and receive a handout detailing all the unique Chardonnay available at Terroir for tasting and purchase so you can continue seeking out your “kind of cool” throughout the afternoon! Bree Seeley advocates that preserving food is more than a twee hobby, it is a dynamic practice that powerfully shapes the identity of our regional cuisine. Preserving food allows cooks to fortify a commitment to Ontario terroir and asserts a role in supporting more sustainable food networks. The delicious results create unique contours in meals and hospitality. Join Bree as she outlines how enthusiasm for robust flavours gives way to a fulsome pantry and colourful year-round Ontario eating. At 2:30pm, we will roam the country roads bound for Barley Days Brewery for a tour & tasting, then onwards to Casa-Dea Estates where we will be treated to a dinner surrounded by vineyards. By 8:30pm, the coach will depart for Ottawa. This schedule gives you time to enjoy all of the activities at Terroir, see the picturesque countryside & discover The County’s only brewery followed by a delicious dinner with Casa-Dea’s winemaker Paul Battliana (in photo at left) who MacLeans Magazine has named as ‘One to Watch’ in Canada. Bonus! A Savvy Sommelier will be on the coach with you offering wine tips, telling you stories about Prince Edward County & answering any ‘County’ questions you may have along the way. Everyone is welcome to join us on this road-trip! You’ve been planning, shopping, baking, cooking, decorating, and mailing (phew!) to get ready for the Holidays…so let us help you create a great dinner for the last day of the year. This take-home New Year’s Eve Dinner from Thyme & Again is an elegant menu prepared by their creative chefs using local ingredients. All you have to do is call the great folks at Thyme & Again by noon on Monday December 29th. Avoid the crowds, the kitchen and the stress! Here’s to a delicious dinner & exciting 2015! Please contact Thyme & Again Creative Catering directly to place your order. Have a very happy New Year’s Eve with friends & family, from all of us at Savvy Company. If you’re a lover of Ontario wines, as many of our Savvy Selections subscribers are, you’ll be delighted with the September 13 LCBO Vintages releases, which showcases the diversity of terroir and wines across the province. This billion-dollar industry has come into its own over the last 30 years, and we’ve been contributing to it! Most Ontario wine is consumed in Canada, and the shift in consumer tastes away from spirits to dry table wine can only accelerate the growth of the industry. The province’s wine industry is located at approximately the same latitude as Burgundy, so we can ripen most Vitis vinifera grapes – Paul Bosc Sr. was one of the first to demonstrate this at Château des Charmes, where the first vines were planted in 1978 – and produce a range of wine styles, from crisp sparkling wines, such as The Grange of Prince Edward County Sparkling Riesling and Peller Estates Ice Cuvée Rosé, through off-dry and dry white or red wines to the iconic ice wine that reintroduced the Canadian wine industry to the world, represented in this release by Château des Charmes’ beautifully crafted ‘Estate Bottled’ Vidal Icewine. 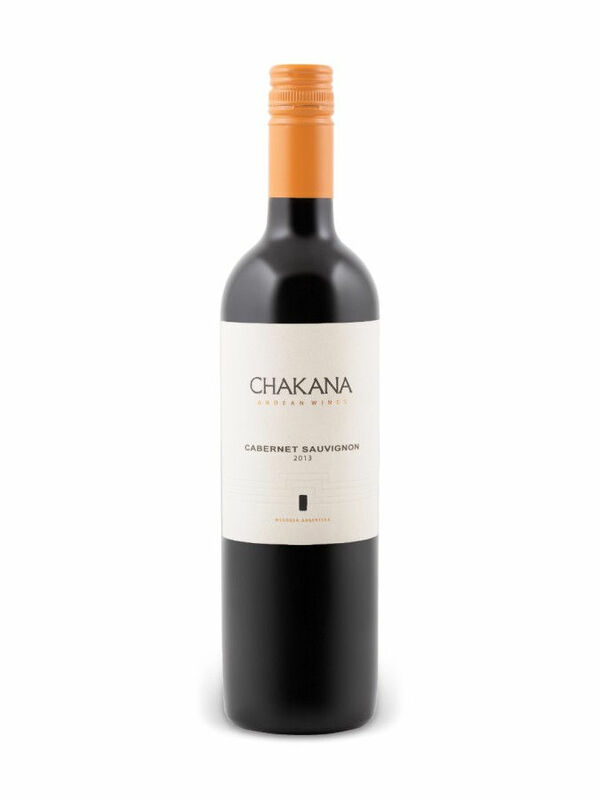 There’s a particular focus in this Ontario feature on the Cabernet Franc grape, which ripens particularly well in Niagara. Used in Bordeaux blends, and produced as a single varietal wine in the Chinon and Bourgeuil appellations in France, Cabernet Franc has come into its own in Canada’s wine regions. 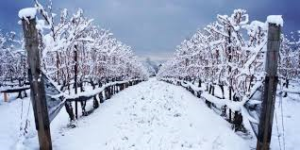 The Ontario feature includes great examples from such producers as Peller Estates, Southbrook, Tawse and Thirty Bench (its Red is built around Cabernet the Cabernet grapes). I have visited Prince Edward County and Lake Erie North Shore several times, and usually make at least one annual pilgrimage to Niagara. It never ceases to amaze me how many new wineries are sprouting from the soil, how successful the well-established ones are, and how many wine lovers are stopping in to taste the wines, meet the winemakers, and take home a selection of wines. 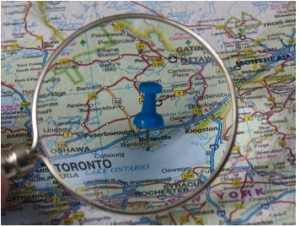 If your schedule doesn’t allow you to visit one of the regions in person, take advantage of this Vintages release to put together your own tasting party of Ontario wines! 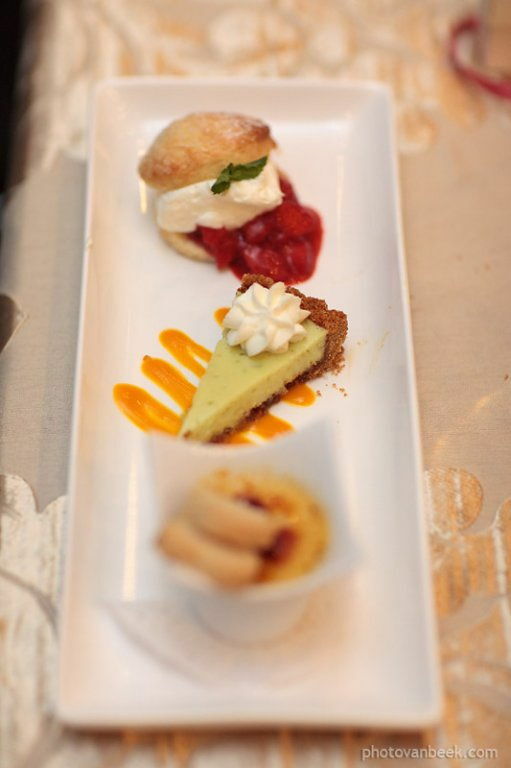 For a real-life taste, come to TASTE 2014. 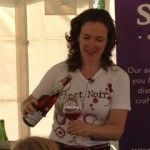 Come & meet some of the region’s finest chefs, winemakers, beer, spirits and cider masters. Sample the best gourmet food from top local restaurants and artisan food producers. Buy fresh produce and VQA wines in our farmer’s market. Come to Prince Edward County and see why TASTE Community Grown is Eastern Ontario’s most anticipated culinary event of 2014. There’s always a secondary feature in the Vintages release, and this one will appeal to lovers of Sangiovese, specifically the Prugnolo gentile clone that is used in the production of Vino Nobile di Montepulciano. This wine is designed for aging and is known for its firm structure, dark fruit and earthy character. Five producers are represented in the release – take your pick! And, of course, there are some great values to be had in the general release, a couple of which are included in the selection below. Fabulous aromas of peach, nectarine, pear, lime and some mineral notes lift from the class of this off-dry white wine. It’s a masterpiece of balance, showcasing a beautifully crisp texture juxtaposed to round, well-ripened fruit flavours and that subtle mineral character. It’s juicy and flavourful to the last drop! Sip well chilled paired with soft cheeses on a warm autumn afternoon. This classic white wine of southern Burgundy combines stone and orchard fruit aromas with the scent of sweet woodruff and smoke. Dry, medium bodied, it’s ripe round texture is perfectly matched to a fine seam of acidity. Flavours of apple and lemon-lime dance on the palate, garnished with a touch of toasted nut. Well balanced and absolutely lovely, it’s a match for lemon roast chicken or your choice of seafood. Dense and inky, this red wine blend offers lovely aromas of ripe dark fruit, earthy notes and hints of lavender and dried herbs. Dry, medium-full bodied, it’s polished tannins and tangy texture harmonize with dark berry and plum. There’s depth and intensity here, spice and smoky toast complementing the fruit on the extended finish. Enjoy with grilled red meats. Ripe aromas of black currant, spice, toast and licorice lift from the glass of this appealing, full-bodied varietal wine. It offers a warm welcome, round mouth feel, soft tannins and generous ripe fruit accented by spice and tasty notes of coffee bean. 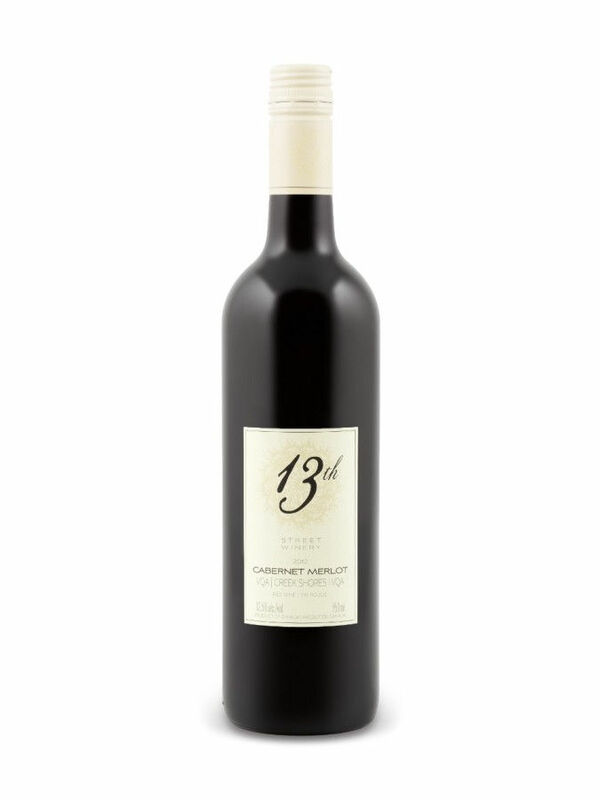 This red wine is a crowd-pleaser with a pleasantly dry finish, it’s a great value and made for barbequed meats. Subtle aromas—cherry, berry, leather, meaty notes, spice and vanilla—tantalize the nose and offer a well-rehearsed intro to the velvety, round texture of this captivating old-vines wine. 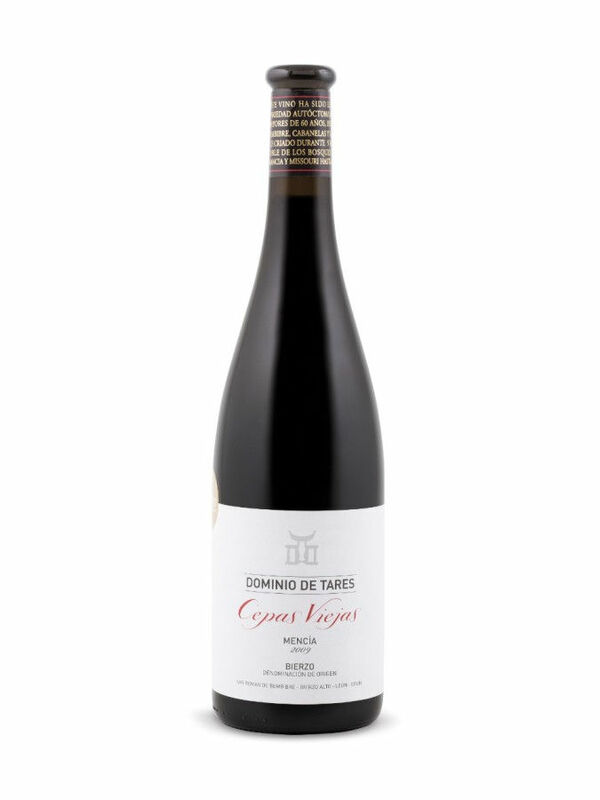 It’s produced from Mencia, a grape native to Spain’s northwest and shown, through DNA testing, to be related to a grape native to Portugal. Dry, combining finesse and power, it showcases great intensity and depth of fruit, a well-defined, refined structure, and the complexity of French and American barrel aging. The dry finish offers warmth and great length. Just fabulous, treat yourself to a bottle and you’ll enjoy tasting this wine before a dinner built around rare grilled meats. Like Father…like Son…2 become winemakers! 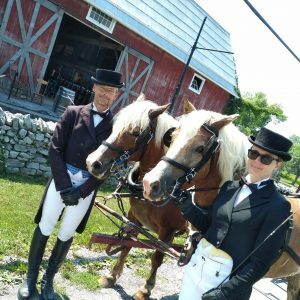 Have you been to Prince Edward County lately? On your next trip, promise me that you will drop in to visit this month’s feature winery Stanners Vineyard. Located ‘at the top’ of the winery map not far off Hwy 401 at the Trenton exit, the winery is perfectly situated to be your first stop into Prince Edward County or last stop enroute home. Mark my word…the visit with winery owner & winemaker Colin Stanner & a tasting of his wines will make your County trip complete. In a life previous to this, both Cliff (father) and Colin (son) Stanners were research scientists: Cliff has a PhD in physical chemistry and Colin a PhD in cell & molecular biology. The two also had considerable experience in winemaking before embarking on the adventure of owning a vineyard & winery. In Montréal, Cliff was a force to be reckoned with in an amateur winemaking club. In the meantime, Colin and his wife (Mary) moved to California in the 1990’s where he took an Intro to Oenology (winespeak: the science & study of all aspects of wine & winemaking) course at the highly acclaimed University of California – Davis Campus (aka UC Davis) learning about wines of the world & winemaking basics. Much experimentation ensued in Colin’s basement small-scale winery where he converted local California grapes into well respected wine. Both Colin & Cliff saw the potential of making high quality wine from Pinot Noir grapes in Prince Edward County (recently named the 4th ‘Designated Viticulture Area’ in Ontario). While Cliff neared retirement, the father & son team were primed for a new adventure. They made the leap to turn their passion for nature & premium wine into reality. The result rivals French Burgundy wines but their goal is not to imitate but bring forth the beauty of the minerality that is characteristic of Prince Edward County wines. 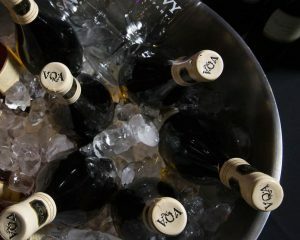 2012 Chardonnay VQA Lincoln Lakeshore $25 – buttery caramel that then turns smoky with a flinty minerality cutting through. At 15%, you might think it too much but think again. Stanners Chardonnay is exquisite. I have said it before…I dream of this Chardonnay. 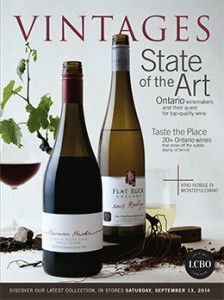 2010 Pinot Noir VQA Ontario $30 – This is textbook minerality from Prince Edward County in a Burgundian-style Pinot Noir. Chill this slightly as you would an elegant & delicate Beaujolais-style Gamay. 2010 Cabernet Franc VQA Prince Edward County $25 – WOWza! The aromas leap out of the glass: ripe dark fruit, baking spices, rose and black liquorice. This will keep in the cellar but let’s be honest….can you really wait? 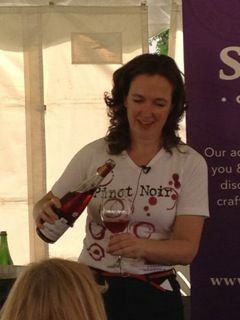 Stanners Pinot Noir is the most critically acclaimed wine of their portfolio. 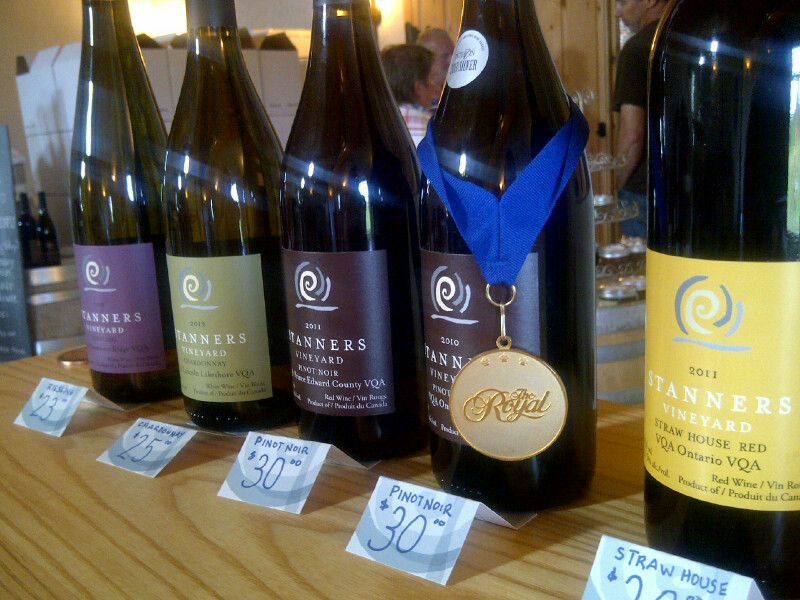 The 2010 garnered a Silver medal and judges ranked it right up there amongst the Top 4 Pinot Noirs in Canada! The Royal Winter Fair voted it the best wine of the show. 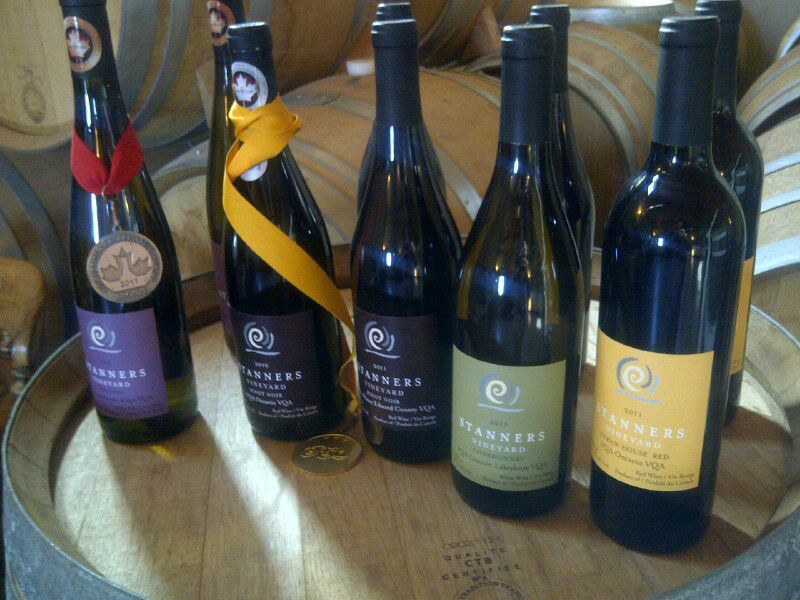 And you heard it first…here, WineAlign’s National Wine Awards of Canada announced that Stanners 2011 Pinot Noir VQA Four Mile Creek was awarded Silver in the category of Red Wines & 2012 Chardonnay VQA Lincoln Lakeshore won a Bronze medal. 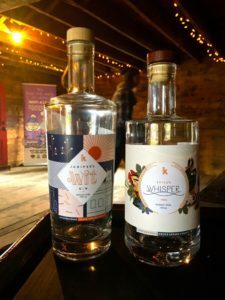 Where to find Stanners wines? 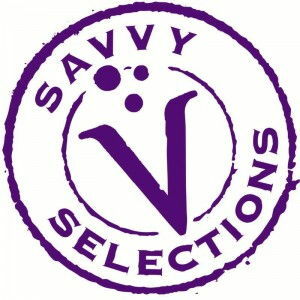 Similar to other wineries we have featured in Savvy Selections, Stanners wines are not on the LCBO shelves. 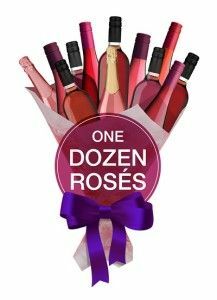 If you would like additional bottles of your favourite Stanners wine – or other featured Ontario wineries – just give me a call on 613-SAVVYCO (728-8926) or send me an email to debbie@savvycompany.ca to arrange an additional delivery for you. It is always my pleasure to introduce you to wonderful new Ontario wines! Colin and his wife, Mary, moved to California in the 1990’s. Armed with an UC Davis introductory course in general wines of the world & winemaking basics, Colin visited wineries at harvest time to bring home grapes to his basement mini-winery. He learned by making wine & making mistakes. He experimented with full cluster fermentation with stems, even ripe stems, resulting in very astringent tannins (think of a mouth-drying sensation like over-steeped black tea). 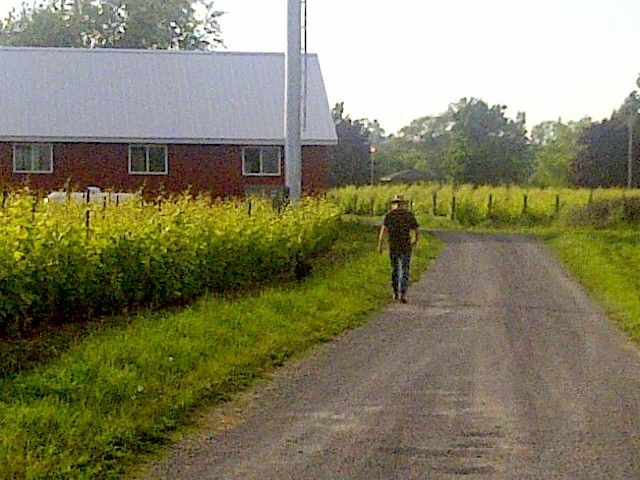 Meanwhile, Colin’s father Cliff discovered the Hillier area in Prince Edward County (PEC) on a cycling trip. Cliff & Colin visited and looked at properties & wineries in this area near Trenton. After lots of research – they are scientists afterall – they chose a property that borders on an environmentally-protected bird area with lots of wildlife. Their extensive research continued as they tasted wines from neighbouring wineries – By Chadsey’s Cairns Winery, Grange of Prince Edward, Rosehall Run, and Norman Hardie – to learn more about the distinct County minerality. The father & son team sought advice from Mike Peddlesden, a key figure in PEC wine industry, and Dan Taylor for economic development. Through this research process they recognized the incredible potential of The County & they were excited to become part of it. In 2003, they purchased the 25 acre property that would become Stanners artisanal, family-owned & operated vineyard & winery. In the fall of 2004, all hands were on deck to grab a hoe or shovel to help prepare the land for planting in the spring of 2005. Pinot Noir vines were growing by 2007 but the grapes were not ready to sell until the harvest of 2009. Then the grand opening of the winery happened at the end of 2010. 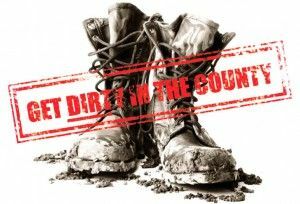 Ever since their opening we have been contacting them inquiring if they were ‘ready’ to be featured in Savvy Selections. 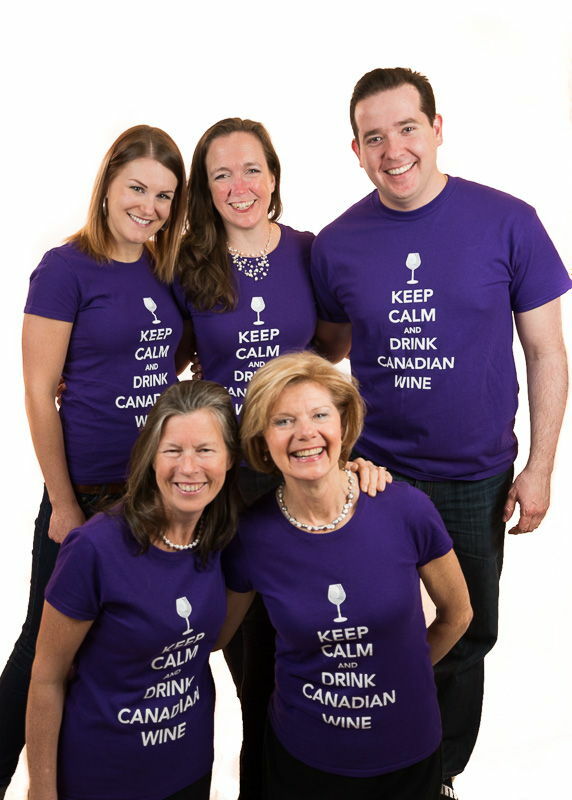 All of us in the Savvy Team are delighted to introduce you to their wines this month. Cliff & Colin (pictured on right) sought advice of many people before building their winery. Their Barrel & Tasting Room are constructed of straw bale which is highly insulated & keeps a constant temperature in a very eco way. Digging a cave was not an option due to the great amount fractured limestone. You can actually see this in different parts in the vineyard: the high spots are full of rock, the low spots have less. This very limestone is perfect for Pinot Noir & Chardonnay. Their roots have to dip deep through the fractured rock to produce concentrated wines. Of the 25 acre property, 18,000 vines are intentionally planted densely into 7 to 8-1/2 acres … the number of vines would fit closer to others’ 18 acres. The first acre was planted 4-1/2 feet between the rows and 3 feet between the plants (not unlike Burgundy France). They really have to hedge down & keep on top of the canopy. Now the Stanners plant 6 feet between the rows. This helps greatly with airflow and the reduction of disease. As you can imagine, these scientists have good reasoning for this approach. The difference between California grapes and those grown in PEC is the Brix level (winespeak: the natural sugar content of the grape). In California, grapes had to be so ripe (at 24-25 Brix) to get flavour. In The County, it takes comparatively only 20 brix to develop phenolic (physiological) ripeness at a much earlier rate. For now, Stanners produce 1000 cases per year. The goal is 1500 cases as they grow bigger. This is considered very small by Ontario wine industry standards. ”The magic lies in how the grapes are handled from vine to bottle,” explains Colin. “The grapes are hand-picked into small flat picking bins. Next the whole berries go into the de-stemmer. No crushing throughout the winemaking process”. Pinot Noir & Cabernet Franc go directly into the fermentation bin where whole berries sit longer & at lower temperature than usual. The must is punched-down by hand then goes into a gentle bladder press. At this time of the year, you will find Colin in the vineyard & working on Pinot Gris in the winery. There will be only 85-90 cases of this popular, pinkish-salmon coloured beauty. They will be grabbed up quickly so get it while you can by calling the Savvy Team to arrange a delivery. At the end of August, picking parties will begin. Although a date is not set, they plan a barrel-racing event with hobby horses. You will definitely see me at Stanners harvest party/parties most likely the 1st & 2nd weeks of October (a little later than usual). I am so excited at the thought of picking followed by lunch & wine. Hope to see you there! Cheers & enjoy your Savvy Selections! The grapes are sourced from a single vineyard in the Lincoln Lakeshore sub-appellation in the Niagara Peninsula. When you have a look at the label, it may surprise you that this Chardonnay is 15% abv (alcohol by volume). So perfectly balanced between caramel & flinty smoky minerality that you won’t notice the high alcohol. Savvy Sommelier Tasting Notes: Buttery & concentrated caramel/butterscotch, ripe green apple & pear, toasted coconut & wildflower honey. But wait! … There’s that medium+ acidity & flinty minerality cutting through that full-bodied, buttery character. As it warms up, white pepper, smoke & vanilla make their appearance. The finish goes on and on and on…. Suggested Food Pairing: Stanners creamy-textured Chardonnay absolutely beckons Gravlax (recipe follows) or bagel & cream cheese with smoked salmon or trout (like they have at Supply and Demand restaurant in Ottawa), pan-seared scallops, classic French onion tart. The slight smokiness will lend itself to barbeque or roasted poultry as well. This is a blend of grapes from Prince Edward County (60%) and Lincoln Lakeshore (40%), hence the VQA Ontario on the label. Bright, elegant & delicate with a Gamay-esque quality. Our Savvy Sommeliers recommend to chill ever so slightly as you would a French Beaujolais. Chilling for 10-15 minutes in the fridge will release the delicate & elegant aromas & flavours. This is a very Burgundian-style Pinot with that distinctive County minerality we have been talking about since page 1! 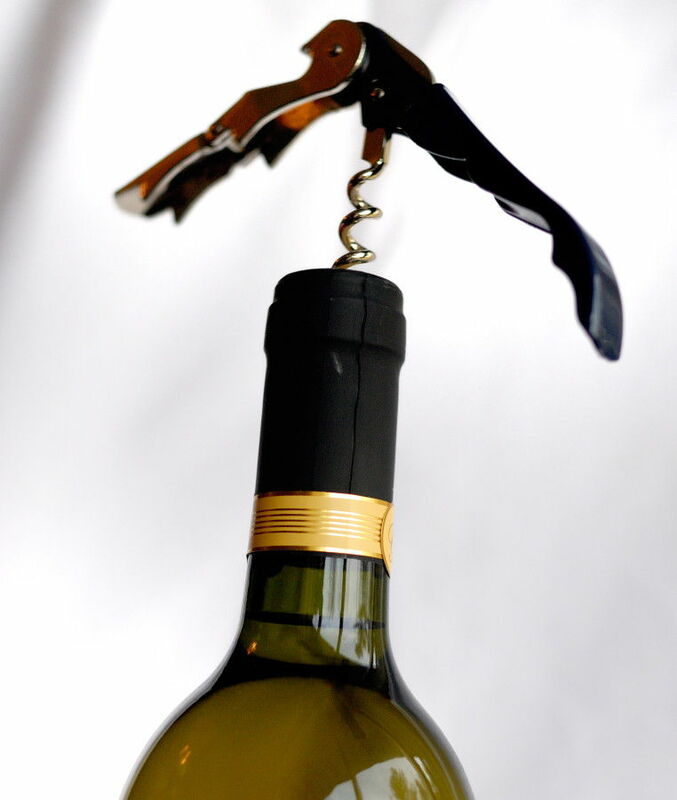 Savvy Sommelier Tasting Notes:Decant or let age for a year or so & you will be greatly rewarded for your patience. It’s coming up roses … the colour, the aroma & flavour. Roses waft through ripe strawberries & pomegranate. Suggested Food Pairing: Chill slightly like a French Beaujolais and serve with: duck confit grilled cheese served with cherry shiraz jelly & Bleu Elizabeth artisan cheese, decadent bacon-wrapped dates stuffed with blue cheese, prosciutto-wrapped figs stuffed with blue cheese; rustic paté, artisanal charcuterie, roast turkey or chicken. This Pinot Noir is very versatile. Ready for a completely different red wine? This one blew all of our Savvy Selections tasting panel away. And at our recent All Canadian Wine Taste & Buy, some of our ‘loyal & regular’ Savvy Event attendees were tipping Debbie off about this wine. “Try it & you’ll be amazed!” they promised. 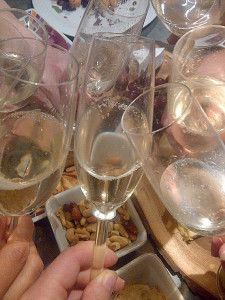 Savvy Sommelier Tasting Notes:And no doubt, they were right…now we’re talking! Aromas & flavours of rip juicy fruit abound. Chock-full of ripe black fruit, plum, cranberry, floral (think red roses), baking spices (think cinnamon or allspice) and good black liquorice. The acidity & tannins are well-balanced for drinking now or this wine will definitely age for a few years in your cellar. Suggested Food Pairing:Spans the range of pairings from pulled pork & burgers to duck, cured meats and Creole-blackened fish. Place the sugar, vodka, 3 heaped tablespoons of salt, the orange zest and the zest from 1 lemon into a bowl. Pick the dill leaves and reserve in a bowl of cold water in the fridge, then finely chop the stalks and stir into the mixture so well combined. Pop the salmon fillets into the bowl, turning them over in the marinade until well coated, then cover with cling film and place in the fridge for 5 hours. Meanwhile, make the horseradish sauce. Add the soured cream, grated horseradish and the juice from ½ a lemon to a small bowl. Mix well, season with a pinch of salt and add a drizzle of extra virgin olive oil, then place in the fridge until needed. Add the beetroot (including the juices) to a bowl with a splash of balsamic vinegar. Season well with salt, then mash with a fork to a rough paste. Have a taste and add a splash more vinegar if you think it needs it, then set aside until needed. After around 5 hours, remove the salmon from the bowl, then wipe off and discard any excess salt. Drain and finely chop the reserved dill leaves and rub all over the salmon. If you’re not serving straight away, sandwich the salmon together, with the skin-side outside and wrap in cling film, then return to the fridge, until needed. To serve, remove the cling film and peel away the salmon skin, then transfer to a board and finely slice. Snip over the cress, then serve alongside the horseradish sauce, balsamic beets, rye bread and lemon wedges for squeezing over. I sometimes like to serve it with a shot of vodka on the side too. Enjoy! Serve with horseradish sauce & beautiful beets. Layer the duck onto a slice of nice sandwich bread; seven grain or whole wheat is a good choice. 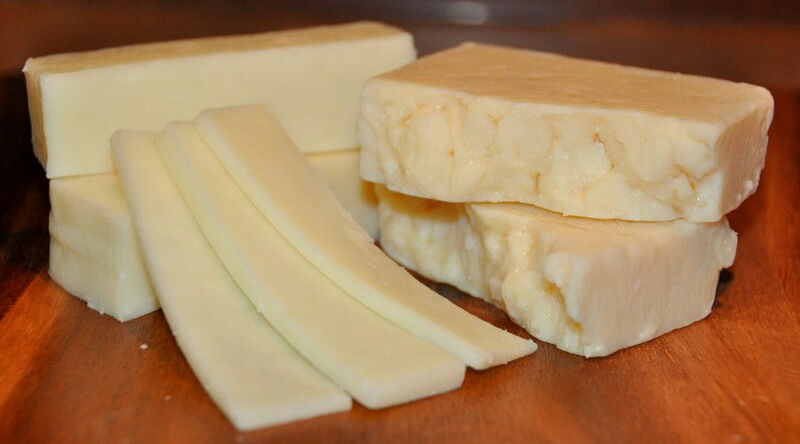 Top with a few thin slices of a mildly nutty tasting cheese that melts well, like Emmenthaler or Fontina. Top with the second slice of bread, and press down lightly. Film a skillet with olive oil (butter burns too quickly), and get it hot (but not smoking) over medium heat. Brown the sandwich on both sides, and lower the heat under the pan, letting the sandwich steam long enough to melt the cheese and get it all oozy. Cut on the diagonal, and let ‘er rip. Sprinkle 1 tablespoon of salt in the bottom of a dish or plastic container large enough to hold the duck pieces in a single layer. Evenly scatter half the garlic, shallots, and thyme in the container. Arrange the duck, skin-side up, over the salt mixture, then sprinkle with the remaining salt, garlic, shallots, and thyme and a little pepper. You can cover and refrigerate for 1-2 days. Melt the duck fat in a small saucepan & brush the salt and seasonings off the duck. Arrange the duck pieces in a single snug layer in a high-sided baking dish or ovenproof saucepan. Pour the melted fat over the duck (the duck pieces should be covered by fat) and place the confit in the oven. Cook the confit slowly at a very slow simmer — just an occasional bubble — until the duck is tender and can be easily pulled from the bone, 2-3 hours. Note: The duck fat can be strained, cooled and reused. Lightly grease a large covered Dutch oven or casserole. Put onions in the casserole. Rub the pork with the seasoning blend or sprinkle generously with salt and pepper then place the roast on the onions and add apple juice. Cover and bake for 5 hours, basting occasionally. Remove the roast to a large platter and shred or chop the meat. Discard bones and fat. Strain the juices and put the solids back into the casserole or Dutch oven. Discard the liquids and add the shredded or chopped pork. Then add barbecue sauce and stir to blend ingredients. Cover and bake for 30 minutes, or until hot and bubbly. This is delicious served with macaroni and cheese or scalloped potatoes, or serve it in buns with pickles, slaw, and baked beans. “It’s summertime and the living is easy”. Our team of Savvy Sommeliers sampled countless bottles of rosé wines made in Ontario to compile The Rosé Report. This will take the guess work out of what taste awaits in many bottles of rosés. Here are just a few of the rosés to get you started. Watch this space for the full report – and it is ongoing throughout the summer – right here at www.savvycompany.ca/rosereport. 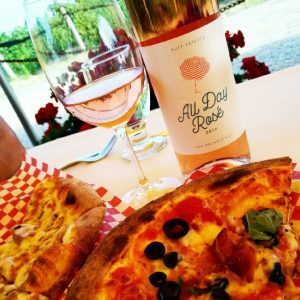 Each week we will highlight a couple of must try Ontario Rosés. Bring on summer! It is not all rosy when it comes to rosé wines, as many people are stuck on the idea that rosés are sweet. Truth be told, they are anything but sweet. 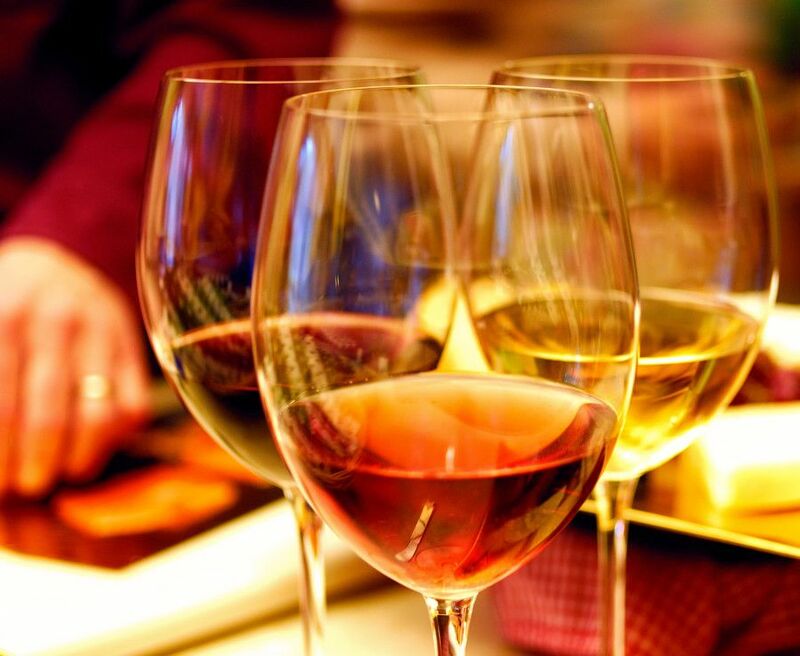 Similar to white wines, rosés are also dry with a refreshing zing to quench your thirst. Many are low in alcohol (9% to 13%) and can range from any shade of pink from pale salmon to candy floss to even light red. 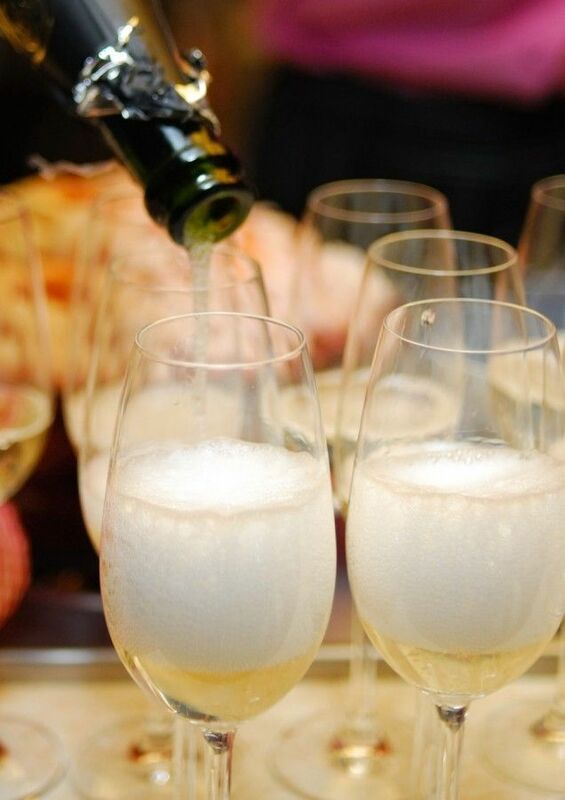 A glass of this bubbly will make anyone happy. A new creation by Dan Sullivan, the owner and winemaker at Rosehall Run Vineyards in ‘The County’, this is a one-of-a-kind mouth watering sparkling wine is made with a unique blend of Riesling, Chardonnay and Zwiegelt grapes. Pop open when friends come over un-expectantly, or those nights when you call out for sushi or chill one for your next picnic. Try your hand at the Watermelon and Feta Salad recipe below – it is a hit with this wine. An understated wine that transforms in your glass with each sip. 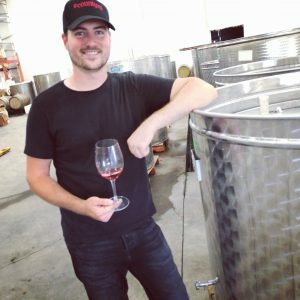 An interesting blend of Gamay Noir & Pinot Noir grapes from Prince Edward County, Rosehall’s winemaker Dan Sullivan again shows off his talent for making fine wines in ‘The County’. Savvy Sommelier Tasting Notes: A gorgeous salmon colour in the glass makes way for delicate yet zippy aromas & tastes of rhubarb, cranberry, sour cherry, floral & citrus (think pink grapefruit). 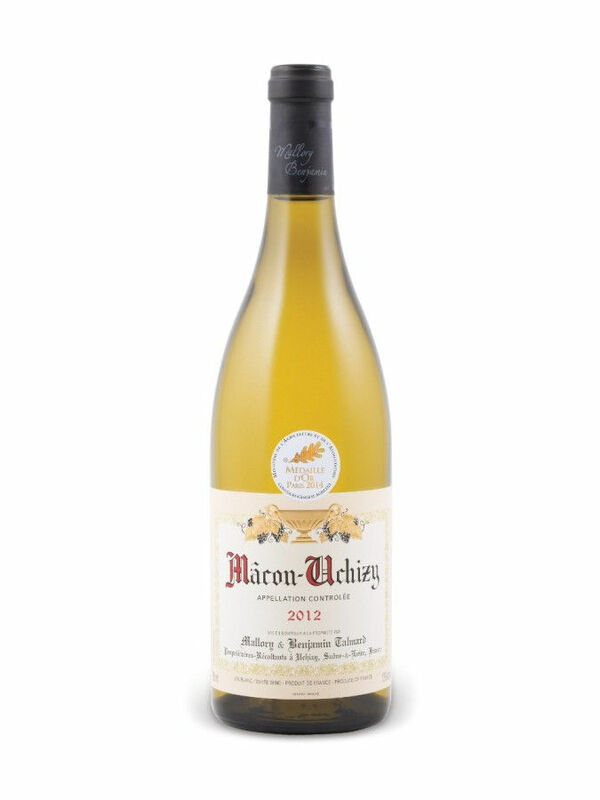 Suggested Food Pairing: This light bodied & delicate wine can easily be overpowered with food, so chill for about 30 minutes in the fridge then uncork this bottle to sip on its own, enjoy with smoked salmon, chilled shrimp or a spinach salad. When he was only 19, Lou Puglisi saved enough money to buy a Camaro sports car…then his father talked him into buying farm land instead. Taking the wise advice, Lou began as a grape grower, then 3 years ago, he opened his doors as Pondview Estates Winery…and he never did buy a sports car! This rosé wine is made with 100% Cabernet Franc grapes. 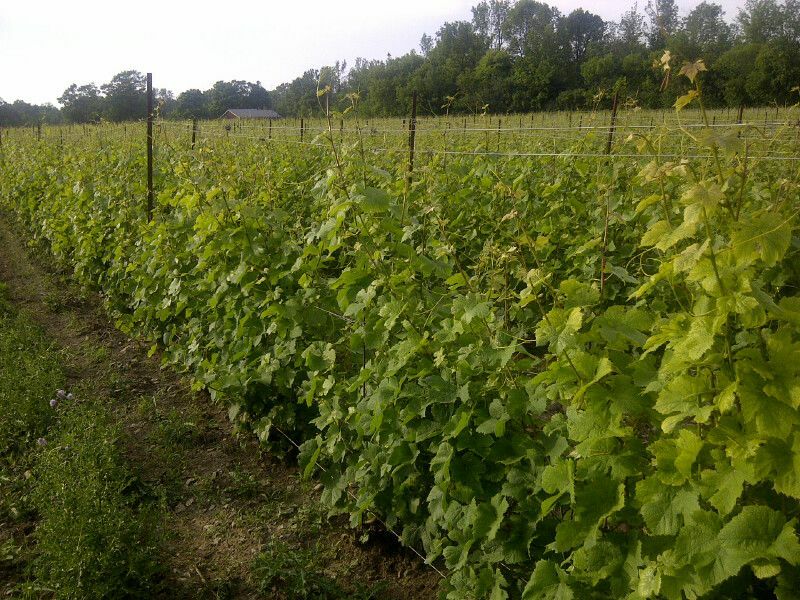 This grape is often used for blending, but now it is growing so well at numerous wineries throughout Ontario, winemakers are crafting wines without blending it with any other grapes. 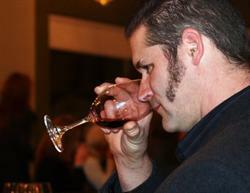 Savvy Sommelier Tasting Notes: “Summer time in a glass” said Savvy Sommelier Shawn McCormick after one sip. A stunning sunset colour, this wine is loaded with aromas and tastes of fresh picked strawberries, peaches & nectarines. Slightly off-dry, this medium bodied wine has good acidity that makes it a refreshing for summer sipping. “A glass or two of this wine with a lawn chair and a good book would be a perfect pairing”, smiles Savvy Sommelier Eva Nagy. Rosé wines delivered to your home, office…even cottage! Mix together all ingredients for vinaigrette. 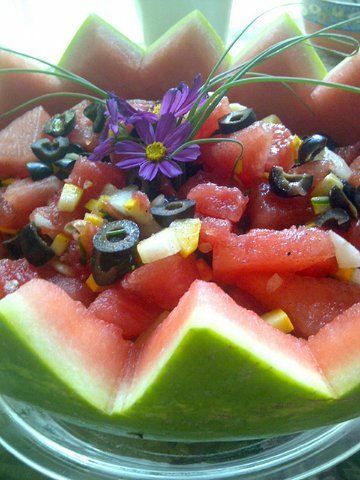 Gently mix in vinaigrette to cover watermelon. Chill until ready to serve. This can be enjoyed as a side salad or thread watermelon cubes on a skewer with black olives and pour vinaigrette over top and serve as a kebab. Refreshing with a crunch and a zing! *Garam Marsala is an East Indian spice mixture that generally includes coriander seed, black pepper, cumin, cardamom, tumeric, nutmeg, cloves & cinnamon. Purchase a package of this spice mixture at an Indian grocery or health food store. Enjoy…and remember to Clink & Drink Pink! Just announced: Terroir is the first Wine sampling event & Farmers’ Market in Ontario licensed to sell VQA wines onsite. This means for the first time in Ontario, guests will be able to purchase wine while at the event, and take it home with them! 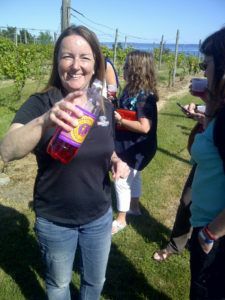 “It is really good to see the government creating a new way to sell 100% Ontario wines. Farmers’ Market sales will be particularly helpful to the smaller wineries who don’t currently have a presence at the LCBO” says Richard Karlo of Karlo Estates. Jump on the Savvy Bus! Discover The County with the Savvy Sommeliers. Enjoy Terroir to the fullest, $99 per person – includes round-trip transportation on a luxury coach, your ticket to Terroir, a visit to a County winery. . . or two! The bus will depart from downtown Ottawa with pick-up stops enroute in west Ottawa as well as Kingston. Many County wineries will be sampling and selling their new spring releases and unique wines while pairing them with delicious gourmet food tastings. 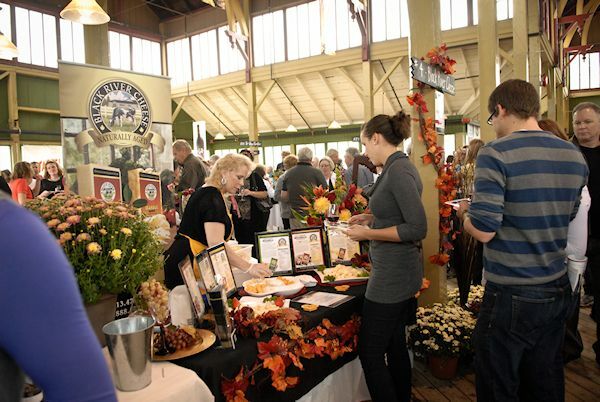 Guests will have the opportunity to meet the winemakers themselves, take part in seminars and demonstrations, enjoy live music, shop for baked goods, preserves, meats, sauces, veggies and more, while tasting some of Ontario’s finest wines. Our Savvy Team of Sommeliers will be at Terroir. Be sure to make time to join Wine Sommelier Debbie Trenholm & our Cheese Sommelier Vanessa Simmons for their Wine & Cheese with a TWIST ‘seminar’. During this half hour, sip & nibble as you learn about County wines & cheeses from the Savvy gals who are constantly visiting the backroads of The County. Who will you meet at Terroir? The event’s $35 in advance ticket price includes all wine samples and three food pairings. Additional food items are available for purchase.